When communism reached Vietnam in the 50s, paranoia struck the country!! Anyone you knew could be a ‘red’. And there was a fairly good chance there were ‘reds under the bed’. This paranoia was fueled by the Liberal Government deliberately using anti-communist propaganda to gain support for going to war in Vietnam. The Reds, or so the propaganda said, were poised to strike, to “destroy the Australian way of life‘ – both from without AND within the country. People were instructed to be vigilant – to spy on their neighbours, their friends, even their family – and report any suspicious behaviour. The “Reds under the bed” propaganda campaign served to distract the Australian public from the real dangers and hardships of the time – a growing inflation rate, and a debt level much larger than what we live with now. It was further used to control striking unions who, the propaganda said, were controlled by the Communist Party of Australia. ASIO grew in power and strength during the 1950s, gaining stronger surveillance powers than it had ever had before. 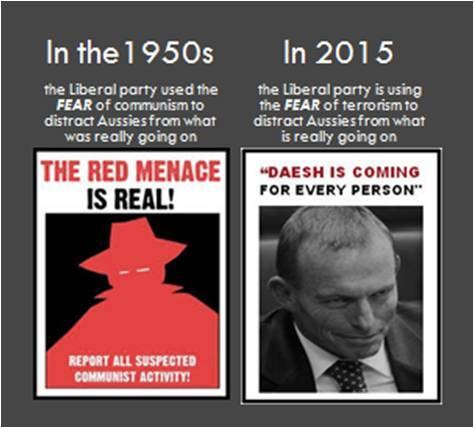 The Liberal party derived further political gain from this powerful propaganda, managing to link the Labor party to the communist party, undermining their voter base. If this isn’t all sounding very very familiar to you….here’s how this plot-line is playing out in 2015. When Abbott was voted in, various jokes circulated about Australia returning to the 1950s. It seems that these weren’t too far from the truth. With 69% of Aussies recently telling the Lowy institute that they believe terrorists pose a HIGH risk to our safety, both at home and abroad, and with terrorism rating as the number one perceived threat to Australian security from within Australia, terrorists have become the communists of this century. Three-word slogan propaganda campaigns designed to distract Aussies from wanting to know the truth. As in the 1950s, the perceived threat of terrorism has been used to take us to war, this time in Iraq – some 11,000 kms away, half way across the globe. And again, as in the 50s, the Liberal government is using its perceived brand as being stronger on defence than Labor to their political advantage, with political polls seeing the Libs get an immediate boost following one of Abbott’s many ‘terror’ talks. In a recent talk he gave on the 11th of June, he literally said “Daesh is coming, if it can, for every person“. “Those who don’t know history are doomed to repeat it”, said Edmund Burke. And it seems Australians have a short memory. So here’s the number one tip in my handy guide to avoid terrorists under the bed – learn from the past. Instead of focusing on a distant threat to our safety and security, we should be focusing on the very real and very current threats to our safety and ongoing security – many of which are listed above – and looking at how we can deal with them. We are allowing trite three word slogans to distract us from what’s really going on, and allowing our politicians to obfuscate and lie their way out of things like #OnWaterGate. The very best way to avoid a terrorist under your bed is to realise that there is very very VERY high probability that there aren’t any there. None. Nada. Zilch. Statistically, even if you assumed that all the terrorist attempts the government claims to have foiled on Australian soil this century actually went ahead, you are still waaaaaay more likely to be killed by falling out of bed than by a terrorist under it. If we don’t do this, if we don’t stop looking for terrorists under the bed, we are facing a bleak future indeed – and it won’t be due to any terrorist group. It will be due to the very poor decisions we are allowing our politicians to make on our behalf, without question and without consequence.